Ophiocordyceps unilateralis is a fungus that turns ants into zombies. The spores infect their bodies, forcing them to climb. They abandon the colony, moving up through the leaves before stopping to bite into a stem. Then they die, still attached to the plant, and the fungus bursts out, showering new spores onto the ground. Exactly how the parasite takes control remains a mystery. But researchers have been using 3D imaging and artificial intelligence to find out. It looks like the fungus turns the ant into a living mech suit. First, researchers from Penn State infected groups of ants. Some received the zombie spores, and others a general fungal infection. Then, they scanned their bodies with an electron microscope. They snapped high-resolution images in 50 nano-metre slices, and these were assembled to form 3D maps. The data was then passed to the AI specialists at the University of Notre Dame. They trained their program to spot the difference between ant tissue and fungus. 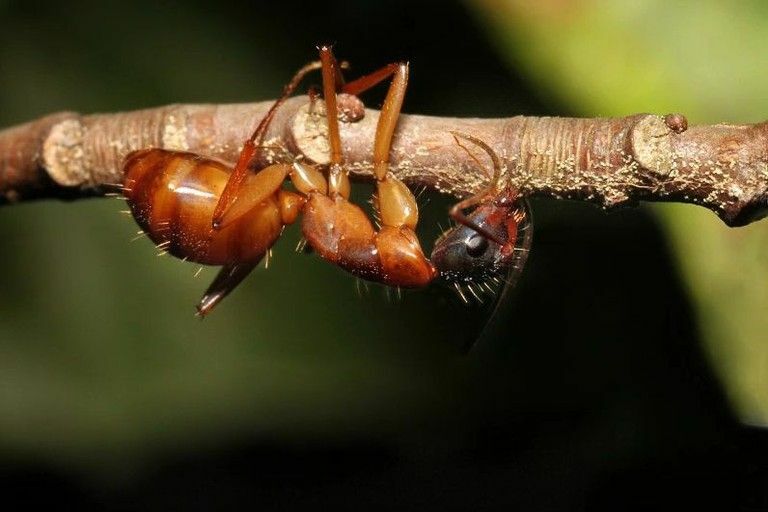 This revealed a network of fungus throughout the ants' bodies, with cells wrapped around the muscles. The parasite seemed to avoid the brain, tapping directly into the limbs and turning the ants into living puppets. "In essence, these manipulated animals were a fungus in ants' clothing." From zombie ants to zombie stars. An international team of astronomers have found a star that refuses to die. Over the course of 50 years it repeatedly exploded and came back to life. When a star goes supernova its core collapses. It’s the last dying breath of the star as it runs out of fuel and tumbles in under the force of its own gravity. And, until now, it's always been the end. But, this star came back to life after astronomers first saw it explode. They spotted the type II-P supernova in 2014 and named it iPTF14hls. But as time went past it refused to dim. Instead, it grew brighter and fainter in cycles. And, when they looked back through the archives, they found an explosion in the same spot 50 years earlier. The zombie star is at least 50 times as massive as the Sun. But, at the moment, they aren't sure what caused its odd behaviour. One idea is that it could be a pulsational pair-instability supernova. According to study co-author Daniel Kasen, this means that the star might have made antimatter in its core. Unstable pairs of electrons and positrons could have triggered a series explosions without a full collapse. But, these types of star are supposed to be extinct. The researchers liken it to seeing a living dinosaur. And finally, from the undead to the almost living. Scientists at Harvard’s Wyss Institute have developed synthetic DNA that grows independently. It could, one day, form the basis of self-assembling DNA robots. DNA is a four-letter chemical code. It’s made from four nucleotide bases, labelled A, T, C and G. These form two strands, which pair up to make the famous double helix shape. In nature, it's mainly used for data storage, but it can also exist as single strands that form complex nanostructures. Molecular nanobots could one day perform tiny tasks like assembling molecules, sorting chemicals or delivering drugs. But first, researchers need a way to assemble long strings of custom DNA. The Wyss Institute has designed a system called ‘Primer Exchange Reaction’ which does just that. The first component of the system called a ‘catalytic DNA hairpin mediator’. It's a chunk of DNA that folds over on itself to form a hairpin shape with an overhang at one end. This overhang sticks to the second component. The 'primer' is a short single strand of DNA that starts the copying process. The system copies the primer sequence and then it moves on to the first hairpin. This contains the next chunk of the sequence. It's copied onto the end of the new strand, and then the hairpin falls off. The strand then sticks to the next hairpin. It adds another chunk of code to the end of the sequence before falling off again. The cycle continues until the full sequence is complete. So far, the team has tested the system by making DNA-origami and DNA that can respond to environmental signals. But ultimately, it's all building up to miniature, self-assembling DNA robots.